1. Mix the rice flour with 100ml cold water in a bowl until smooth, add the cayenne and the beaten eggs, and season. Mix until smooth. 2. Heat a 23cm non-stick frying pan. Add the sunflower oil, over a medium heat. Pour in a layer of the pancake mix, top with the salad onions, then the prawns, seafood sticks and jalapeño pepper. Pour over the remaining batter mix and cook gently over a medium heat. Flip over after 3 minutes and continue to cook for 3 minutes on the other side until golden and crisp. 3. Stir the chilli paste through the mayonnaise. 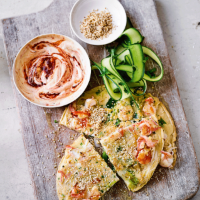 Serve the pancakes cut into pieces, sprinkled with the sesame seeds and a bowl of the spicy mayonnaise, a little cucumber salad and a cold beer.